They all have one other important aspect in common. These all specify solid colours. But that’s what CSS3 opacity does isn’t it? Closer to a tiled, flat colour semi-transparent PNG, without the image. Browser support is ok, but not great. So how can we use this today without ending up with a nasty old mess in rubbish old browsers that don’t support all this lovely RGBA stuff? 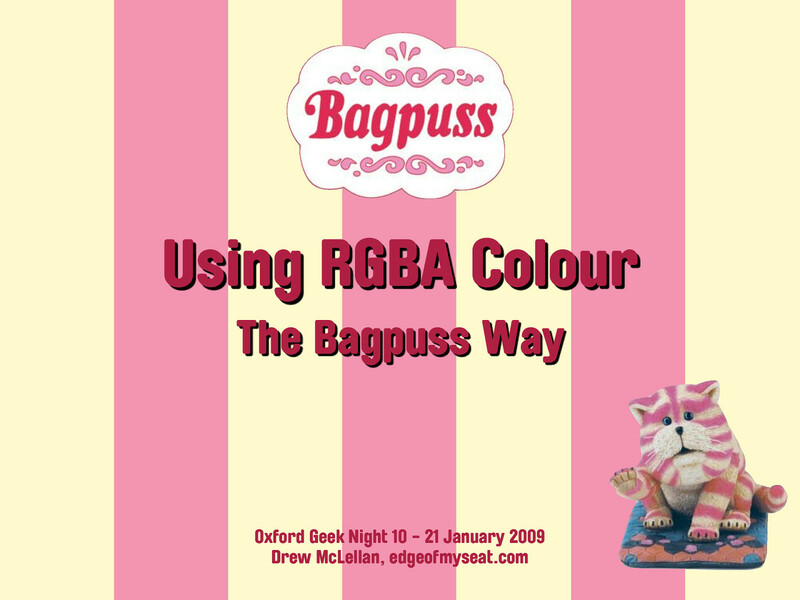 View Using RGBA Colour The Bagpuss Way on Notist. A lighting talk about the use of RGBA colour in CSS for Oxford Geek Night 10. Heading off to Oxford Geek Night 10. See you there.